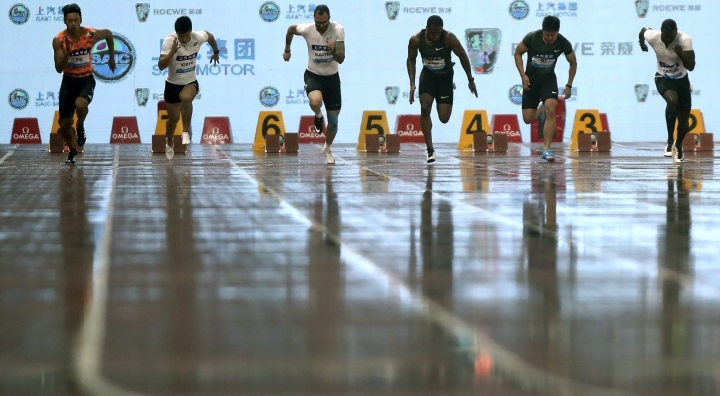 SHANGHAI — Olympic and world champion Omar McLeod surprised himself by edging the men's 110-meter hurdles at a rain-drenched Shanghai Diamond League on Saturday. The Jamaican narrowly defeated Orlando Ortega of Spain by one hundredth of a second in an ordinary 13.16 seconds to capture his third successive victory in Shanghai. "I was kind of overcome with emotions because I've been through a lot this season," McLeod said. "I was hurt a month ago (with an unspecified injury). I still was feeling some slight pain, but I was like, 'I'm here.'" McLeod, who skipped the Commonwealth Games, admitted after the race he's still not fully fit. "My leg is a little bit sore but my body's in shock because it's just fatigue and I haven't been able to do a 110 workout in like a month," he said. "It's just a lot of emotions." In the final race of the night, British sprinter Reece Prescod won the men's 100 in dramatic fashion in 10.04 seconds. 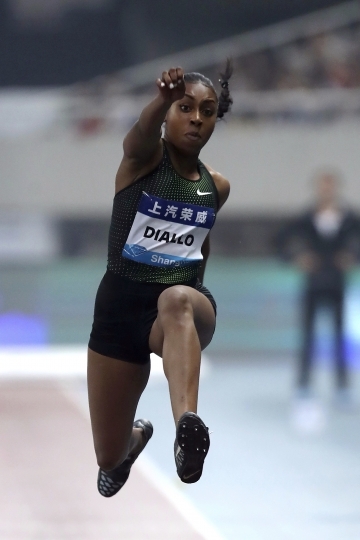 It was initially believed Chinese sprinter Su Bingtian won, but video replay showed Prescod came out of nowhere in lane nine to narrowly defeat the fan favorite. 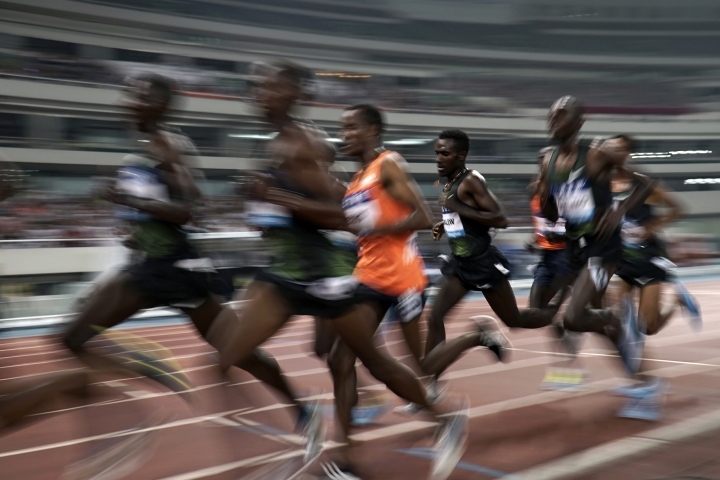 Chinese sprinter Xie Zhenye was third, and world champion Justin Gatlin was seventh. 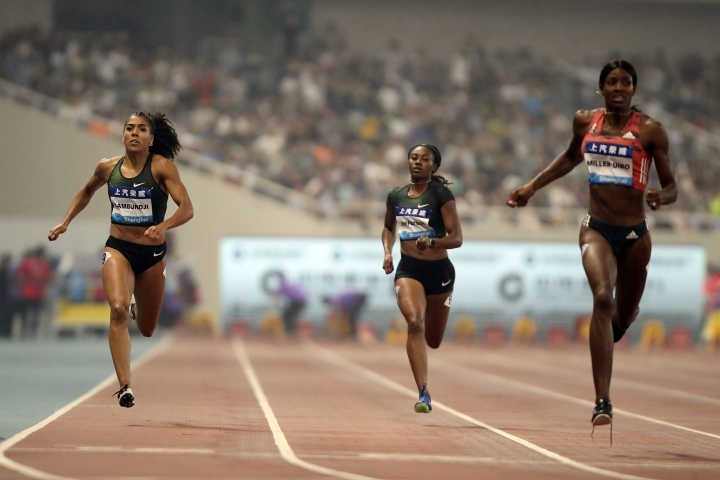 Olympic gold medalist Brianna McNeal won the women's 100 hurdles in a meet record 12.50. U.S. women finished 1-2-3-4, with Sharika Nelvis and Kendrick Harrison filling out the podium. "I kind of got behind in the middle, but I just tried to keep my composure and try to finish strong," McNeal said. Bahamian sprinters had a strong night as well. Shaunae Miller-Ouibo won the women's 200 in 22.06, and Steven Gardiner set a 400 meet record of 43.99 to beat out Botswana's defending Diamond League and Commonwealth champion Isaac Makwala. Olympic champion Delilah Muhammad won the women's 400 hurdles in 53.77, barely fending off a late charge from Commonwealth champ Janieve Russell, who lost by one hundredth of a second. 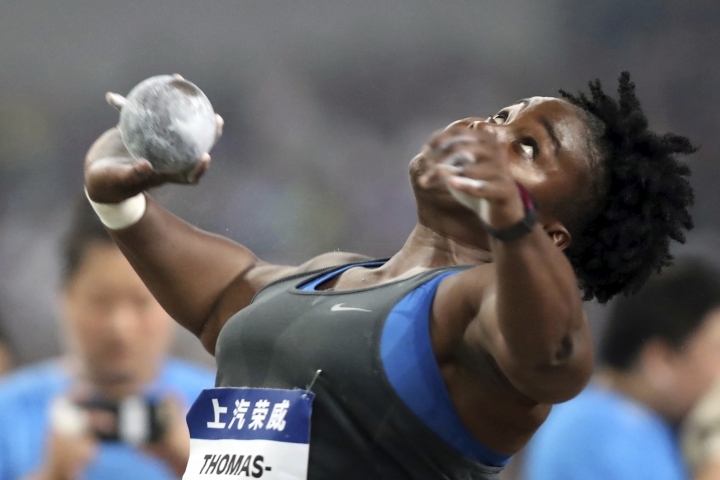 Defending Diamond League champion and local favorite Gong Lijiao won the women's shot put with a throw of 19.99 meters, securing her fourth Shanghai Diamond League victory. Eight women threw 18-plus meters for the first time since the same meet in 2015. Wycliffe Kinyamal set a personal best in the 800, out-sprinting fellow Kenyan Jonathan Kitilit on the home straight with a time of 1.43.91. Countryman Timothy Cheruiyot kicked off a strong defense of his Diamond League title, winning the 1,500 with a world-leading 3:33.48. Olympic champion Caterine Ibarguen from Colombia won the women's triple jump, and Mariya Lasitskene of Russia earned her 38th consecutive win in the women's high jump. Other winners include Luvo Manyongo of South Africa in men's long jump, Lyu Huihui of China in women's javelin, and Renaud Lavillenie of France in men's pole vault. The next Diamond League event is in Eugene, Oregon on May 25-26.